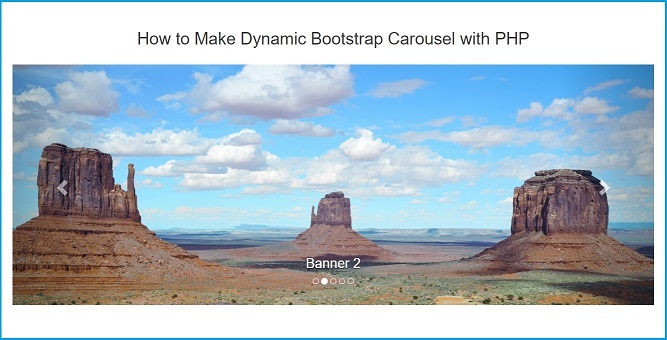 If you have looking for web tutorial on How to Create Dynamic Product or Image Slider by using PHP then you have come here for right post in which we have discus topic like How to developed dynamic slider by using Twitter Bootstrap Carousel with PHP Script. Usually We have put Image Slider or Product slider on our website home page and in this we have display our online store hot product and from that customer can go to that particular product page. So it this slider make dynamically then on every day we can display different product images in slider on daily basis. So here we have make this simple web tutorial in which we have create dynamic image slider by using Twitter Bootstrap with PHP script and Mysql database. For implement product slider we have use Bootstrap Carousel plugin, by using this plugin we can easily make simple image slider. But here we want to make image slider dynamically so we have use PHP simple script. In this script it will fetch banner data from Mysql table and make dynamic code as per Bootstrap Carousel. So, If we want to display other images in slider then just we want to change table data and that php script will make slider as data available in table and that will display that particular image in slider.